I am sitting outside our office watching seagulls chase a great bald eagle. Isn’t the eagle bigger, faster, and probably smarter then those seagulls? Why does it not just spread its wings wider and leave the babbling birds in its dust? 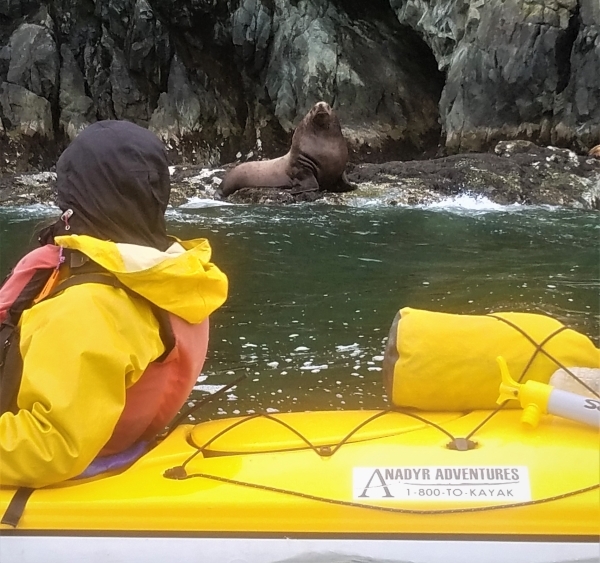 Why do harbor seals like to chase our kayaks around? How did that giant iceberg at Valdez Glacier Lake move from the back end of the lake to the middle over night? What flowers will be in bloom after all the deep purple shooting star flowers fade from a meadow near Columbia Glacier? These are the mysteries that I love most about Prince William Sound, and one of many reasons I so greatly enjoy kayaking with new folk around this beautiful area. May has passed by in the blink of an eye, and now June is bringing new smells, flowers, animals and mysteries. The sun is out in full force this afternoon and the Water Taxi from Columbia Glaciers trip is pulling up to the dock with smiles on everyones face right now. Did the man who really, really, really wanted to see a whale get to see a whale today?! I hope so! I hope that eagle gets some respite from the seagulls and that the sea otters will be waving at us tomorrow, just as they have been every day this week. If you come out I hope you create some mysteries for yourself!